On the cusp of retirement, I set up this blog in March 2011 as a way of sharing some thoughts and photographs from my daily wanderings about the wilds of Albuquerque and occasionally other places. Birding, butterflies, other nature photography, and travel to other parts of the world in pursuit of same are high on my list of favorite things to do. I’ve also kept up a website at http://sandianet.com where I archive some of my better pictures and stories. Enjoy. Hello Joe, my name is Terry & I have a YouTube channel. I teach how to speak Navajo on YouTube & am interested in using one of your Mount Taylor pictures for a video on how to properly pronounce the Four Sacred Mountains in Navajo. Let me know if this can be a possibility! Thanks! I work for the Natural Resources Conservation Service Montana State office. I’m working on an educational publication called “Montana Pollinators Education Project.” It is a project to supplement Montana educators in their classroom. I was wondering if I could use your digger bee photo. Sure you can, Nikki. I’d appreciate your putting a photo credit somewhere if possible, and let me know if you want a higher-resolution version of the picture. My name is Natalie – I work for New Mexico EPSCoR at UNM and I’m currently working on a video about biodiversity in the Sandia Mountains. I’d like to use some of your bird images, if that’s alright with you. I’m happy to credit you and send you the link to the video when it is done. Feel free to contact me with any concerns. Hi Natalie. Thanks, and yes you’re welcome to use some of those images and I would appreciate being credited and look forward to seeing your video. Great stuff; linked you up at my blog. I photographed a very large moth a few days ago, and was wondering if you could help me identify it. Is there a way I can send you the photo? Any chance you’d be willing to let us use it in our materials? 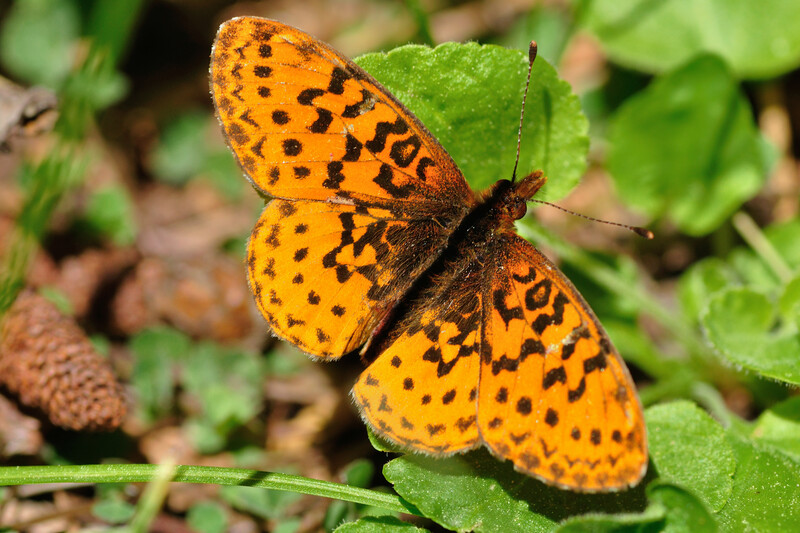 We just saw our first boloria epithore at one of our Preserves and we’re showcasing it in our annual report. A good picture will help tell the story! Credit would be of course given. Absolutely, Sarah,and thanks for showing a photo credit. I love all your photos! Thanks so much for sharing. I write non-fiction nature books for children and try to use my own photos whenever possible, as the series is called “Nature On Our Doorstep” (you can check them out on amazon.com if you’d like to see the kind of thing I do – just search for Annette Meredith). The idea is that children can see the very same beauty if they step outside their back door and look more closely at the world around them. The books are also packed with information. I’m currently writing a butterfly book and I’d love to be able to include some photos of butterflies seen in other areas of the US, not just NC where I live. I would obviously give you credit for any photos, if you’re willing to allow me to use them for my book. There’s no money in being a children’s author, I’m afraid, so I can’t pay you – I do this for love, not money! If I can inspire even one child to become an environmentalist, it will be worthwhile. Thank you, Annette. Great idea about inspiring children – they need to get outside more and discover the wonders of nature. Will send you an email shortly. Great stuff, Joe. I’m really interested in the butterflies around Albuquerque. Can you send me a private email? nature_photo_man@hotmail.com This is not spam. I’m an avid birder in the Albuquerque area. But one species I struggle with is owls. Any suggestions where I might look for nesting owls this time of year? I’m a photographer and would really enjoy photographing these beautiful birds. Thank you for your time. I’ll send you an email with a few ideas. Hi Joe, just did a lovely tour of your butterflies and birds. I can see why you’ve become avid. Thanks, guys. Great seeing the two of you again, too. I enjoyed your blog, it’s provided me with so much helpful information. I am only here in New Mexico on a temporary job. I love photography, birding and being outdoors, so here I am hiking before and after work and having a great time. I was wondering if you could help me identify some birds I saw yesterday up in the Sandia Heights off Elena Gallogos Ct. Many of these birds are new to me, since I have lived in minnesota, florida and maine but only a visitor to this beautiful state. Thanks so much for all the info and great shots. How do you post photos in Comments? Great you’re enjoying our birds around here, and I’ll be glad to help you identify them. No idea how to post photos here, but I’ll send you an email with a few ideas on how to let me take a look.